When Ryan Connon climbs into his sleeping bag, he hopes—more so than most campers—that it will keep him warm. 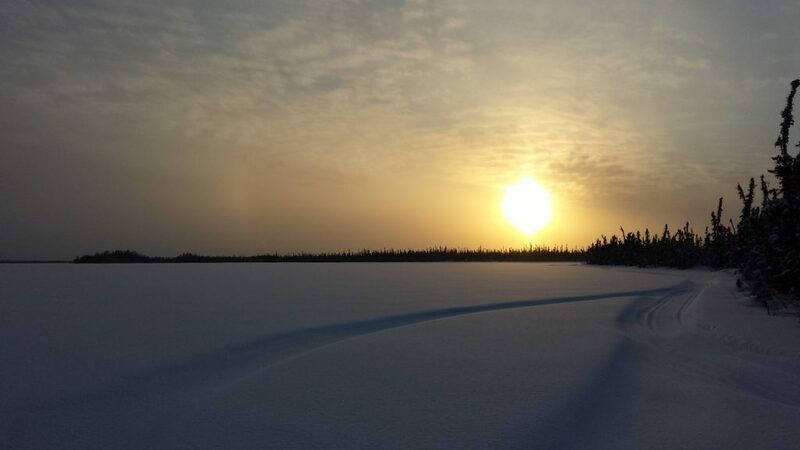 Because here in the Northwest Territories, at the start of March, it’s not unusual for overnight temperatures to drop below -25 degrees Celsius. “Minus 20 is OK. It’s when it drops to minus 30 that’s when you feel it,” says Connon. Over the years the Stratford, Ont. native has become an expert at lighting matches with hands made thick and slow by extreme cold. A northern sunset captured by Connon. He’s learned to survive in a remote landscape where smartphones, double-doubles and traffic jams are irrelevant, replaced by tasks like thawing dish soap over an open fire. The 27-year-old isn’t an extreme outdoorsman and he’s not on a journey of self-discovery. Each spring, Connon and a handful of researchers camp along Goose Lake, in an area known as the Scotty Creek Research Basin (SCRB). The nearest town, Fort Simpson, is 50-kilometres north. 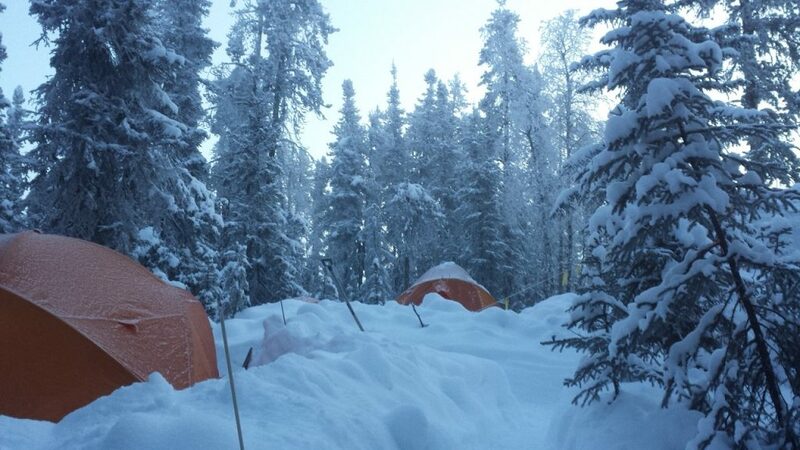 Connon and other researchers face cold weather conditions camping in the Scotty Creek Research Basin, N.W.T. 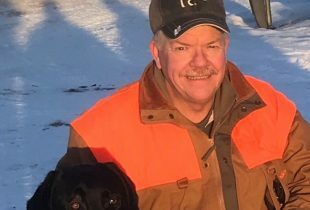 “Aside from the other researchers…you’re really alone with nature and that’s an experience that you don’t often get,” says Connon, a former Ducks Unlimited Canada Legacy Greenwing who’s been captivated by water systems and Canada’s north since he was a child. 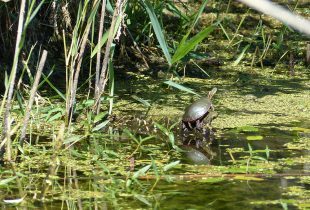 “I’m glad that my interest in water and wetlands was sparked when I was young. Because today, I really love what I do.” Connon is in the home stretch of completing his doctoral degree in hydrology at Wilfrid Laurier University. 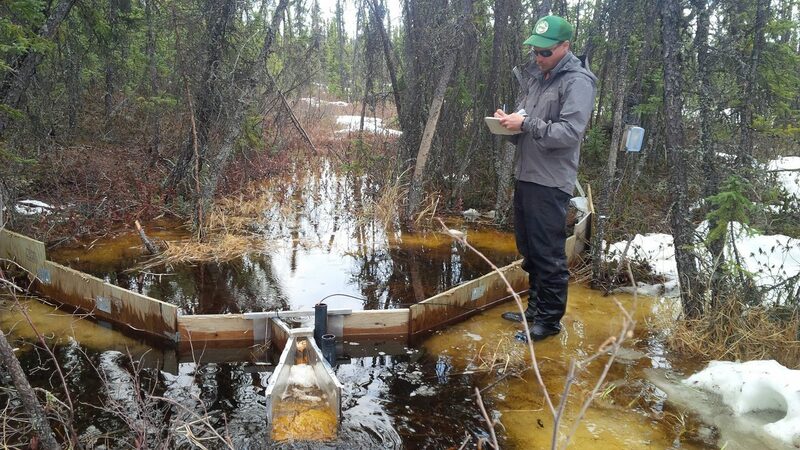 As part of his thesis research, he’s travelled to the SCRB for the past five years to monitor the rate of permafrost thaw and its affect on the landscape. Connon measures snow properties, like the density, depth and grain size of the ice crystals (snowflakes). 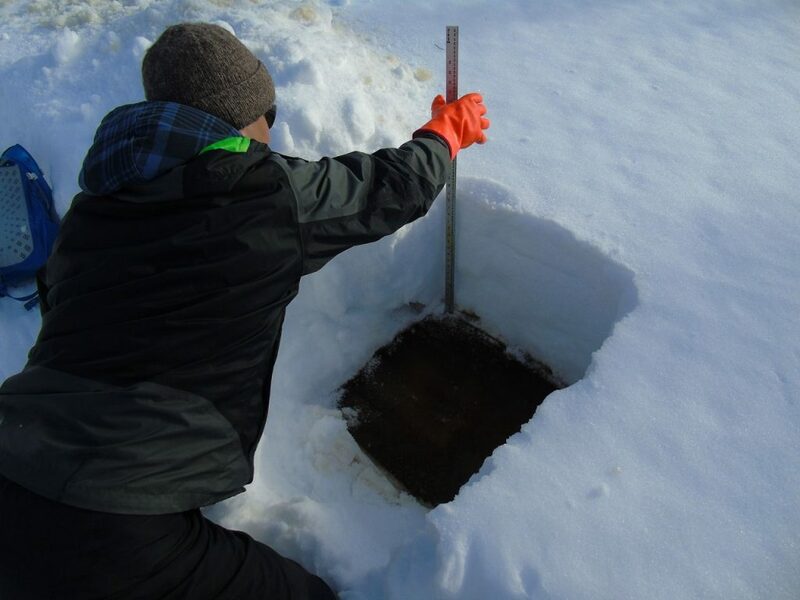 This data helps him determine the snow-water equivalent of the snowpack to determine how much water will be available for runoff when the snow melts. Much of northern Canada is encompassed by permafrost—ground that’s remained below 0 C for at least two years. In 1940, 70 per cent of the ground in the SCRB was underlain with permafrost. Today, that number sits closer to 40 per cent. Researchers have said Canada’s North is warming at one of the fastest rates on earth. It’s more than a headline: it’s impacting the landscape, says Connon. 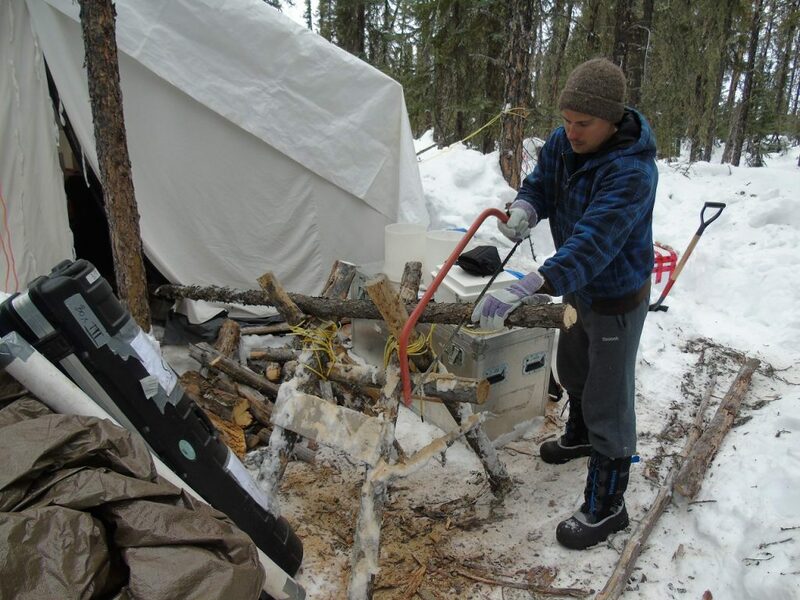 Aside from thawing dish soap, every few days Connon and other researchers saw wood to fuel their wood stove. “Permafrost only exists under forested peat plateaus, which in the SCRB, and other southerly parts of the territory, are interspersed with wetlands. As permafrost thaws, these forested areas are shrinking and wetlands are becoming larger and more interconnected,” says Connon. Travelling by snowmobile, Connon throws tracers, like dye and salt, in flowing waterways and looks for it downstream in order to learn how quickly water is moving across the landscape. He inserts a measuring rod into the ground to measure permafrost. The deeper the rod sinks into the ground—the more permafrost that’s been lost. Through his research, Connon’s discovered that in the past 20 years the amount of water flowing in river basins in the Lower Liard River valley has nearly doubled. 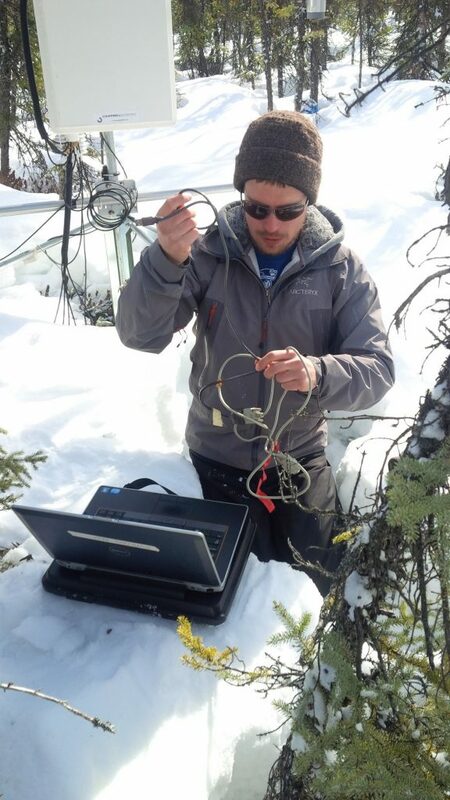 Connon uses a laptop to download data from a meteorological station researchers installed on-site. The information helps inform his hydrology work. This is important because when streamflow reaches a point that the channel it’s entering can no longer support it, flooding occurs. “There have been highway washouts in the territories. There has been flooding, but fortunately, not in areas where people live,” he says. Connon hopes to expand the scope of his work to learn if what’s taking place in the SCRB is happening elsewhere. 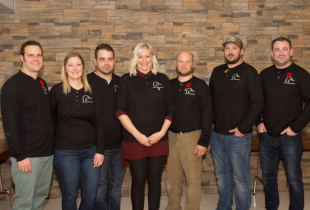 “Some of my friends call me crazy for travelling up here, to spend five months of the year in a tent…but we need to keep an eye on how these systems are going to change in the future,” says Connon. DUC is working with researchers at Wilfrid Laurier University to map wetlands across southern portions of the N.W.T. Researchers at Laurier rely on DUC data to map permafrost and permafrost-free terrain in southern parts of the territory.